For most of us, the Internet has become a constant fixture. Imagine a day without using Google, posting photos online, or checking your email! The same can be said of businesses who consider the Internet as an indispensable tool for their daily operations -- from video conferences, employee training to large file downloads. Whether you're a solopreneur or running a team spread across the country, a day without Internet connectivity, or even just super slow connectivity speed, could translate to decreased productivity and even worse, profit loss. 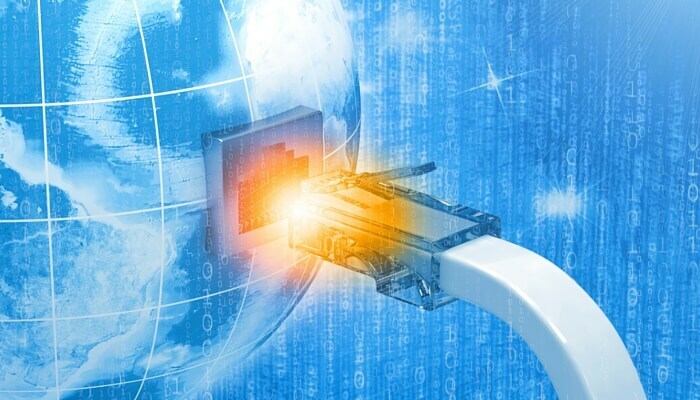 Internet connectivity is so valuable that fiber connectivity can boost value to real estate properties. While it's incredibly easy to sign up for the first Internet access provider offer you'll come across, smart business owners understand that choosing a broadband provider means carefully taking stock of several variables before making the decision. At the end of this article, you will have a clearer picture of what you should require from business Internet access providers the next time you're shopping for the best in your area. How fast do you really need your Internet connectivity to be? How much bandwidth do you anticipate requiring? How many devices do you estimate are going to need to transfer data? Do you need point-to-point connectivity? This is an old Internet technology (in the case of DSL, the successor to dial-up modems). It is affordable yet unreliable by today's standards. This type employs local telephone lines to transmit data, and the farther you are from the line, the more sluggish connection you get. Cable Internet mainly relies on standard coax cable lines that were originally run to provide television service. This is one of the most popular options for both residential and business customers. Speed may be slower during peak hours because bandwidth is shared among users in the vicinity. For businesses, this option is obviously better than DSL or cable. For one, as we noted in fiber-optic internet vs. copper cable, you almost always get equal download and upload bandwidth. Fiber also provides scalability -- you can start with 10 megabytes today, and if you need 100 megabytes (or much more), your provider can easily increase your bandwidth. 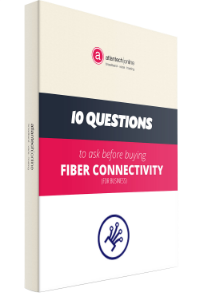 Simply contact your provider, who can increase your fiber bandwidth immediately without a service call or installation projects. One easy way to check on fiber internet availability in your area is to use our free tool. For more information on how much bandwidth you need for your business, we earlier wrote about it here. This is another variable that should be on top of your list. Data center security poses one of the biggest Unified Communications risks to small businesses. Sure, there are lots of provider options out there, but not everyone can guarantee that you will be protected from spam, spyware, viral threat, and even intrusion. The company should be committed to security, even down to doing background checks on their own employees. A good guide is to see if the company undergoes an audit such as an SSAE 16 validation which does address how security is managed and maintained. Most ISPs take 30 to 60 days to set up a connection to a new location. When shopping for your business ISP, you and your provider should be working closely with regards to timetables and expected delivery times. When things go south on your connection, you need customer support who goes the extra mile. Yes, it's all about computers, servers, and bits of data, but if your ISP lacks that human touch, it's probably high time that you switch business internet access providers. In most cases, solid customer support is even worth the extra expense. Apart from fantastic customer care (check online reviews! ), opt for a provider who offers 24/7 technical support. How quickly does the ISP respond to a reported outage or send their field service techs on site if a failure occurs? Check for field response policies and make sure that they meet your business needs as well as possible worst-case-scenarios. Often, it takes a day or two for a team to fix outages by being physically present in the area. Imagine how a day's worth of delay will impact your business. There are a lot of advantages to combining business internet and phone services. Not only can you expect to save on cost, you skip the hassle of multiple bills, support systems, and the runaround you often find when dealing with separate vendors. When you have issues, you won't get the "It's the VoIP provider's fault" excuse. These days, everything evolves so rapidly that you never know when a new Internet technology will surface. This is why it pays to work with a provider who understands the need to be future-oriented. Take IPv6 for instance. It is the next generation protocol for IP addresses. If your business is willing to push the envelope when it comes to technology, it pays to have an ISP who shares your enthusiasm. Does your enterprise require faster-than-normal upload and download speeds? Or do your operations require only the usual web browsing and mail setup? Your answer plays a role in choosing the right business Internet service for your needs. Plus, you need to consider how many users will be connected at one time, and what they will be doing while online e.g. do they need to check emails, share files, or upload videos constantly. Also, is your ISP throttling bandwidth at certain times during the day or when using certain services? At its core, the Internet is the global system of interconnected computer networks that use the Internet protocol suite (TCP/IP) to link billions of devices worldwide. An Internet Service Provider (ISP) connects your office network to the many interconnected computer networks that make up the Internet. The ISP connects to these networks via transit (paid) and non-transit (non-paid) connections. The connection to every network in the world is known as a route. When you choose an ISP, whether they have transit or non-transit connectivity (in most cases it is a combination of both), what your business cares about is being able to get to every network in the world which you need to connect to for your business to succeed. Shockingly, there are major United States-based national ISP’s who refuse to pay any transit fees for connectivity, and they, therefore, cannot connect you to the entire Internet even here in the U.S., as they have been unable to negotiate non-transit agreements with every carrier. As always, knowledge is power. Knowing what you should look for in an ISP can spell the difference between profit and loss; between achieving optimum production and poor delivery times. Still, you alone know the full nature of your business and operations. The takeaway is to find an ISP who makes an effort to understand your business needs, and who can make adjustments to accommodate both your short-term needs and long-term goals. Haven't made the decision yet? Ask a trusted expert for more insights on how to choose the best Internet access provider for your enterprise. Get all the information you need to make the smartest decision for your business' connectivity.